Cardio has always been a go-to for those who are trying to get fit or lose weight. To achieve this goal, will you “go hard or go home” and get on the HIIT bandwagon? Or, are you more into “slow and steady wins the race” and pace yourself with steady state cardio? 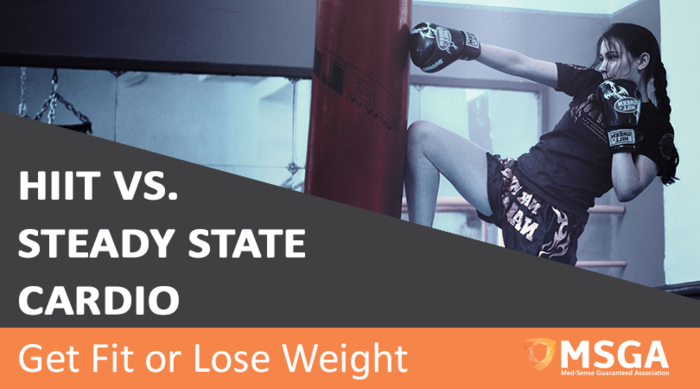 To find out which program is better for you, let’s take a look at HIIT vs. steady state cardio. HIIT aims to reach up to 80% to 95% of your maximum heart rate or to up to level 9 of the perceived exertion chart. This is accomplished by pushing your body well out of its comfort zone followed by a period of recovery. Each work set can last from 5 seconds to 8 minutes depending on your fitness level. The recovery period can be shorter or the same duration as your work set. Steady state cardio, on the other hand, is exercising at a similar speed and intensity all throughout. You are aiming to approach level 4 or 5 on the perceived exertion scale. HIIT has gained its popularity with a lot of fitness enthusiasts because of its many benefits. Studies show that HIIT stimulates both the aerobic and anaerobic systems providing your body with more stamina. HIIT also improves your insulin sensitivity helping your body utilize glucose efficiently. People who are trying to lose weight can get the most out of HIIT exercises. After a HIIT session, your body burns calories while trying to get itself to its pre-workout state. The longer and more intense your workout, the more calories your body burns after. HIIT is also very effective in burning abdominal fat compared to other exercises. And, since you’re working at a very high intensity, you can still reap the benefits of your workout within a shorter duration compared to other workouts. While HIIT has great health benefits, it has some drawbacks as well. During a HIIT session, you are pushing your body out of its comfort zone. It can be a very steep learning curve, especially for beginners. If you are coming from a sedentary lifestyle, make sure to modify the workouts according to your fitness level to avoid injury and burnout. Steady-state exercises are great for those who want to build their body’s endurance. The exercises are at a lower intensity spread across a longer period of time so it improves endurance in your heart and muscles. A lot of those who do steady state cardio report that its an exercise that they can enjoy. It is more comfortable to workout at a lower intensity than pushing your body outside of its comfort zone. It also allows you to recover faster after each session. Steady state cardio requires a longer workout period just to burn enough calories. Some people may find this boring and too repetitive. These repetitive exercises may put you at risk for stress injuries and may lead to a weight loss plateau. Make sure to challenge your body with different exercises. by cross-training.